When it comes to furnishing the great indoors, wood furniture is the natural choice. It's beautiful, sturdy and blends in well with practically any design scheme. That's why Cedarwood Furniture stocks a huge selection of choice indoor cedar, ash and acacia wood furniture and sets for your home. 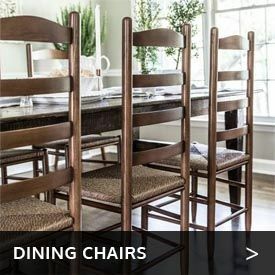 Here you can find individual pieces, like comfy rocking chairs and handy benches, as well as complete sets, such as indoor dining and bar ensembles, to furnish your dining room, bedrooms and practically every other place inside your home in natural beauty and comfort. Thanks to their careful construction and the moisture- and insect-resistant nature of cedar wood, some of these pieces and sets can be used outdoors on your patio or porch as well as inside. Our cedar pieces also make smart choices for closets and bedrooms, because cedar's aromatic oils will naturally repel moths and other pests that can damage or destroy clothes, bedding and blankets. In addition, we carry indoor furniture made of beautiful and durable ash hardwood as well as acacia, a hardwood noted for its resistance to water and scratches.